See: How to Measure for Cabinet Doors, How to Measure for Drawer Fronts or How to Measure for Dovetail Drawer Boxes. To place an order call 1-501-262-5100 with credit card information (unless prior arrangements have been made). We accept Visa & MasterCard. If multiple quotes are requested verify all the information on the correct quote(s) to be placed as an order. Phone order(s) are read back as verification of order(s). Receipt of order(s) emailed, faxed or placed on internet must be confirmed. Placing an order over the phone, fax or email is verification you have verified all the information and you are accepting order without changes. By executing a release, the Company and/or persons hereby authorize Cabinet Door Shop, at its discretion, to proceed with order. Consumer has carefully evaluated alternatives, sizes and shipping address before making a decision to release. We acknowledge that such release is verification of evaluation of alternatives, sizes, quantity, and width x height, shipping address and it has been accepted per quote. Approvals by the consumer certify (or declare) that all the information we submitted with quote, including any accompanying statements or documents, is true, correct and complete. Cabinet Door Shop is not responsible for carrier fees for address change, residential fee, docking fee or any additional charges. Release is verification for payment to be processed. Order(s) given are in acceptance of all information provided by Cabinet Door Shop Ltd Co. For any additional information needed contact Customer Service. Customer have 24 HOURS from time original order is placed to make any changes. Changes must be made with a Cabinet Door Shop representative. Add-on(s) are not guaranteed to ship same day as original order. Being a custom built manufacturer, we shall NOT accept any returns on Cabinet Doors, Drawer Fronts, Panel Ends &/or Dovetail Drawer Boxes. Customer remains bound and obligated to/for any and or all order(s) placed until written confirmation "As Released" by authorized representatives of Cabinet Door Shop Ltd Co. 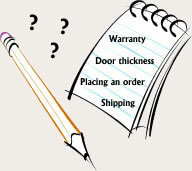 Cabinet Door Shop is not responsible for additional fees charged by shipping company(s). All claims responsible to Cabinet Door Shop Ltd Co. must be submitted within fourteen (14) calendar days of receipt of order. Cabinet Door Shop is not responsible for damages incurred in shipping. We suggest inspection of merchandise before signing for shipment. Note any damage "Damaged Product" or suspected damage "Subject to Inspection-Possible Damage". To file a claim, call your local terminal and request a "Claim Form". Keep damaged goods and container for freight company inspection. For any assistance please call Cabinet Door Shop. Cabinet Door Shop Ltd Co. warrants that all doors are guaranteed to be specified with work being performed in accordance with specifications submitted in a substantial, workmanlike manner. Mineral streaks, color burls, grain patterns and all other natural characteristics are not considered defects unless specifically addressed by Cabinet Door Shop Ltd Co. Cabinet Door Shop's tolerance (due to the inherent nature of wood) allow for some contraction and expansion of the door-dictated by its environment. Cabinet Door Shop Ltd Co. is not liable for damages caused by negligence or improper: storage, finishing, handling, assembling or installation, by any person. Product(s) must be finished within 2 weeks of completion of order(s). Product(s) cannot be returned without prior approval. Call for a Return Goods Authorization (RGA#) and clearly mark the outside of the original package(s) with that number. All products must be returned in original package. Products will not be credited that are marked on, have job-site damage or modified in any way. Product(s) must be in re-sellable condition. Returns are F.O.B. buyer and are subject to a 20% restocking charge or minimum of $25.00. After 60 days from ship date on invoice, the restocking charge of 20% or minimum of $25.00 with an increase by 10% per month. Cabinet Door Shop has the right to refuse any return.